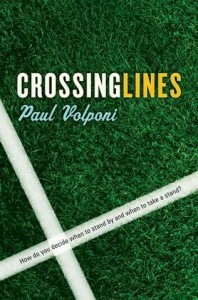 Paul Volponi, 2011. Adonis (yes) is a football player whose only interests are the next big game, getting the hot girl, and bonding with his teammates over burgers and bigotry. When new kid Alan dares to not only be openly gay, but to join the Fashion Club and wear drag to school, it creeps Adonis out. Unfortunately, his little sister Jeannie and his hottie girlfriend Melody are also in Fashion Club, and they’re Alan’s best friends. Adonis’s unwillingness to accept Alan for who he is makes his mom and Jeannie think he’s a jerk; in front of Melody, though, he’s down with the homos. He’s able to make the football team believe this is just to up his chances of getting in Melody’s pants, but in reality, he’s not sure how he feels. Yeah, he’s freaked by Alan’s gender presentation, but that doesn’t mean he wants to beat him up and pull practical jokes like the other jocks. The jocks plan an attack on Alan onstage at the Fashion Club’s first show; Adonis knows about the plot but doesn’t intend to participate. He ends up jumping in and helping Alan, which makes the jocks hate him; then he confesses he knew about the prank all along but didn’t tell anyone or stop the bullies, which makes Melody hate him. Adonis is a pretty unhappy camper until he has an epiphany and decides to befriend Alan as Alan, without any ulterior motives. Paul Volponi is an excellent storyteller, and I generally rush for his new books as soon as they come out, but ultimately Crossing Lines is disappointing. Oh, it’s a perfectly acceptable book – it makes a good point, is paced well, and I stayed interested in what would happen plot-wise – but the characters are not well-drawn. We know nothing about most of them except for how they feel about Alana. Adonis is a caricature of a jock jerk, and his transformation in the end is too swift to be believable. It’s too bad the talented Volponi didn’t put the same effort into character development here that he did with Hurricane Song or Black and White. This entry was posted in 2011, drag, gay male, gay-bashing, high school, Paul Volponi, problem novel, realistic, secondary queer character. Bookmark the permalink.